And my sister, seven years older, had outgrown the patience to play with me, as her attention turned to boys, being a twirler with the band, and performing at the football games. Oh, how I longed for her velvet and sequined costumes. 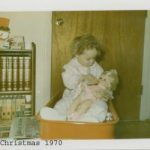 I arrived home from school one December Day to a big surprise: my mother had put up a tiny tree in my room and it was decorated with little felt dolls: toy soldiers, little blonde girls in Christmas dresses, and, of course, Santa and Mrs. Clause. I had begun collecting dolls earlier that year, so the sight of all those little felt dolls made me feel so special and so loved. I set up that little tree Christmas after Christmas until I was around twelve and began to outgrow dolls and Santa and the little table the tree sat upon. Until this year, I had forgotten about that little tree. I had also forgotten how, in so many ways, the mother of my childhood had been loving and generous. Years of her depression and dissatisfaction at life had replaced the moments of light. 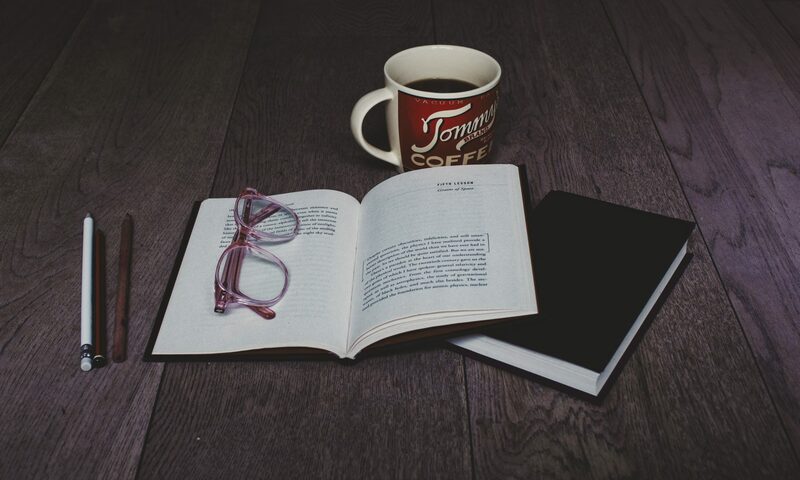 The tantrums she threw and the hateful words she directed towards me as I grew into adolescence and womanhood overwhelmed all the kind words and gestures, pushing those memories to the recesses of my mind. Instead, the memories that typically surface are the hard ones. I remember being a nineteen year old newlywed, so proud of my new home yet feeling confused as she screamed at me, telling me I was selfish for moving into a new house without her approval. Her demands that I “return everything she had ever given me since my marriage.” It’s far easier for me to recall removing pictures from the walls, filling boxes with decorative knickknacks, and piling sweaters on top than it is to recall blue-clad soldiers and smiling, blonde-haired, felt faces. The memories of neither of my parents meeting my second child until after her second birthday are stronger, oh Tender Heart, than the faded memories of a hand-stitched stocking adorned with little Gingerbread Men and my name in Gold. Those years of pain and stress and rejection, I must admit, put layers and layers of protection around you, didn’t they, oh, Tender Heart? I have a truly wonderful life, but I have to admit, this year has been as difficult for me as the year I was seven. There is so much anger and stress and pain in the world, it’s been a challenge to see the world from a place of love. I create best from a space of peace and calm, and the environment of the outside world sure hasn’t been any of those things lately. I dove into spiritual activities to soothe my soul during all the unrest in the world. 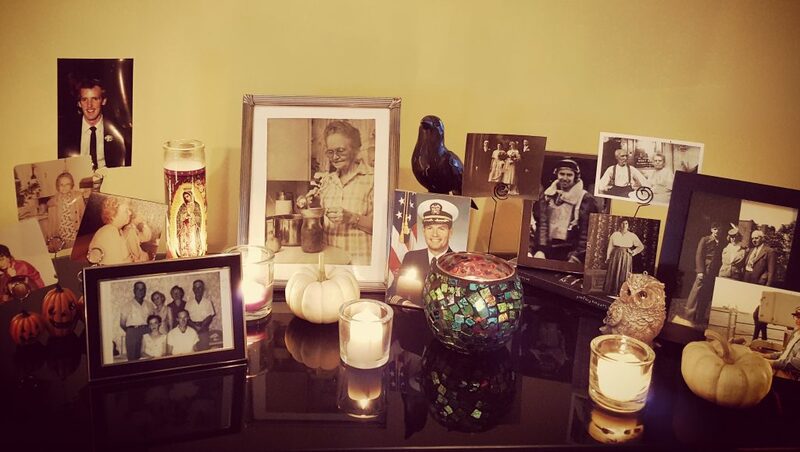 During the period between All Hallow’s Eve and Thanksgiving, I set up an “Ancestors Altar” to honor the Beloved Dead during the season of All Saints and All Souls Days. I gathered symbols of the season: an owl, a raven, and tiny pumpkins. I retrieved the photo from our living room of my grandmother and the one of my parents along with their parents at a wedding shower, the only photo I have of either of my grandfathers. I found a photo of my friend who died on 9/11. 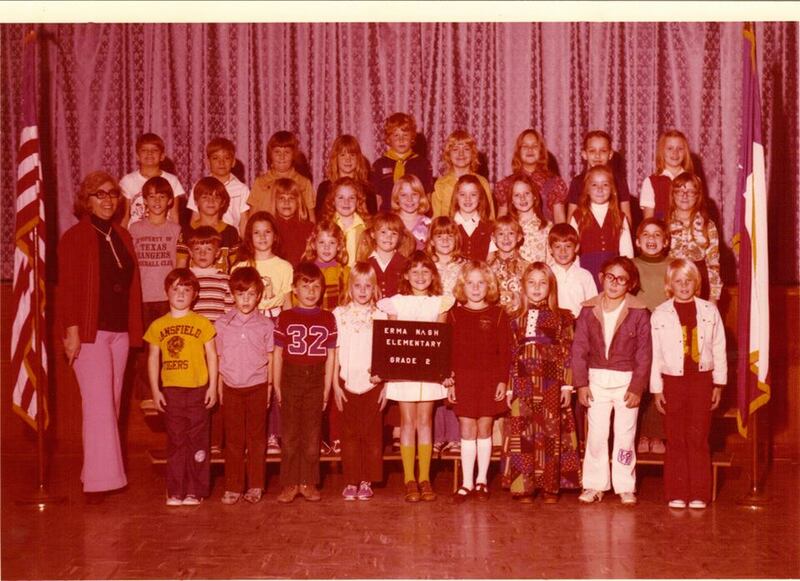 I dug through our photo albums. First I pulled out photos of John’s grandparents, great grandparents, father, and brother. 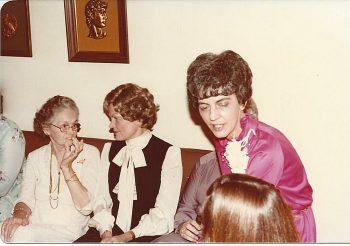 Then, I found the photos from my sister’s first wedding shower and bridesmaid luncheon in 1981. There, I discovered a photo of my Aunt Betty, who died two weeks after my mother. Then, I found this one photo, a picture of my mother laughing with her sister, Nita, who died in the 80’s along with their mother – my grandmother – who died in 1992. My mother was so young and full of joy in that photo. Still raven-haired and dressed in a bright pink dress. The mother I had before the years of depression dulled her sparkle. The mother who loved a young Debra, rather than the woman who seemed to despise the woman little Debra grew into. Every morning through the fall, dear Tender Heart, I lit candles on that altar. I prayed for the souls of all those gathered there, seeing each face as a Beloved. I walked by their smiling faces several times a day and they kept me company as I worked. And each day, that gaping wound of not being good enough for my mother to love began to get smaller. The walls I have constructed around you, on Tender Heart, began to crumble just a little. That is the mystical power of intention, candles, and prayer at work. When Thanksgiving drew close, I knew it was time to break down my altar. I put away the candles, raven, and owl. I discarded the softening pumpkins and lovingly gathered the photos to save for next year. I had no plans for another altar until St. Brigid’s Day in February and realized how bare the space would feel without the smiling faces, so I decided to put up a Christmas tree. I found a little tree at Target, on sale for $15. I bought extra lights and tiny baubles. It’s a happy little tree, illuminating the Spirit of Christmas as I work. John arrived home from a business trip and I showed him my little office tree as we prepared to decorate the rest of our home. Then I remembered my first little tree standing in a room of my own, and I shared the story, and cried. “You know, that’s the nicest thing I’ve ever heard your mother doing for you,” he replied. He has been my witness. By my side, celebrating each Christmas with me since my mother died. This is my sixth Christmas without her, oh, Tender Heart, and only now am I able to reach into the depths of memories and retrieve interactions with my mother that don’t involve pain or more heartache. 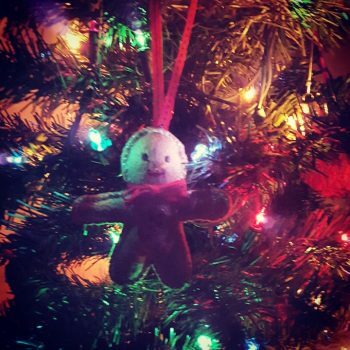 I chose a couple of felt gingerbread men to adorn my new little tree; not like the toy soldiers or felt Santa, but still with the nostalgic memories of Christmas as a Child and the stocking my mother created with her own two hands. The remembrance, oh Tender Heart, of creations from love instead of the unimaginable space of anger and dislike is critical to extending these tenuous feelings. Now, each morning, I turn on the lights on my personal Christmas tree. 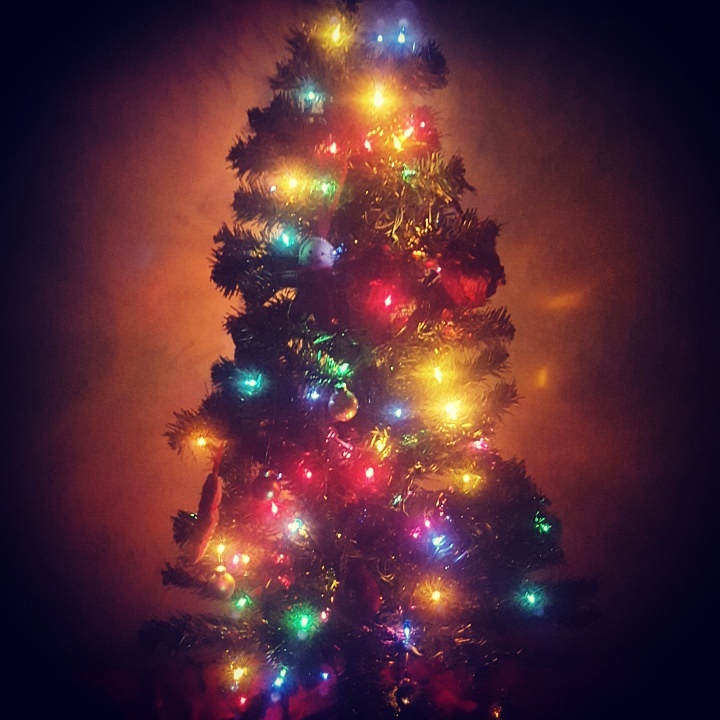 I sit in a recliner – displaced for the Christmas Tree of John’s Christmas Past – writing in my journal or reading, and, like the smiling faces from those old photographs, the twinkling lights illuminate the dark, shining love and hope, nostalgia and remembrance of the other little tree. Each day, oh Tender Heart, you find a way to heal a little more as I seek a way to recall the loving gestures instead of the hateful ones. I am allowing the magic of honoring ancestors and the mystical power of grace and forgiveness to help me forget the bitterness. Though 2016 has been a challenging year, this gives me hope that 2017 has the potential for more. May you continue to find love, oh Tender Heart. And heal. Debra is a life coach and the Editor in Chief of Modern Creative Life. She is the author of three books, including the recently released Clearing Soul Clutter: Creating Your Vision. She lives in Ohio and believes in the power of Love.